We are back to work in late August, These first pictures are our visit to Goa. We are eating lunch at the home of the Kalra's. He has been the branch president here for over 15 years. He took us to a restaurant on the beach for dinner, where they offered us fresh crab. We are with the family of Suzanna in Goa. The sea breeze at the Goa beach offers the perfect place to sift the rice. The birds appear to be helping, but I am not sure how. The beach was clean, beautiful, pleasant, and virtually empty. The Indians generally want to have lighter skin, so they avoid spending much time in the sun. So if you want to enjoy a beautiful, uncrowded beach, come to Goa, India. When they do go to the beach, the women remain fully clothed. A typical outfit for the girls to wear to their birthday party includes butterfly wings. Kimberly celebrates her birthday after her baptism with family, friends, and cake. We were able to attend the Lingarajpuram Branch primary program. The kids did a super job! And they look great in their color coordinated dress. One of them is named Darwin. Can you guess which one. We enjoy every chance we have to visit families in their homes. October 30 marked a special day in the mission, as President Nelson visited Hyderabad. His busy schedule included a mission conference with all the missionaries, who traveled to and from the conference on overnight trains. It was an inspiring conference. President Nelson is amazing at his youthful age of 91. It is always great to be with the missionaries. We had lunch with the Grundy's at Bawarchi's, a favorite of the missionaries for chicken biryani. Below are three amazing missionaries from Orem, Utah. We passed this unusual looking building, which the taxi driver told us was a fish market. Imagine that. October and November are times for two of the big Hindi festivals in India--Dashara and Diwali. Dashara is a ten day festival celebrating good over evil. At the conclusion of the ten days they immerse idols in water, go to each other's houses and exchange gifts and sweets. Diwali is also known as the festival of lights and signifies the victory of light over darkness, knowledge over ignorance, good over evil and hope over despair. Its celebration includes millions of lights shining on housetops, outside doors and windows, around temples and other buildings. The celebration lasts 5 days and includes lots of fireworks. They paint the entrances to their doors. This family gets together for a Diwali dinner, dressed in their new clothes. A play depicting the good king triumphing over his evil opponent. The aftermath of fireworks, a beautiful sight to Kyle. November 15 was an historic day as the first stake was formed in Bangalore, or Bengaluru. Elder Rasband, a new member of the Quorum of the Twelve Apostles, officiated and is shown to the right greeting the members. We, along with the Grundy's, got to work in the mission home to help prepare the food for the visiting authorities. They opted out of the chance to try the spicy Indian food. 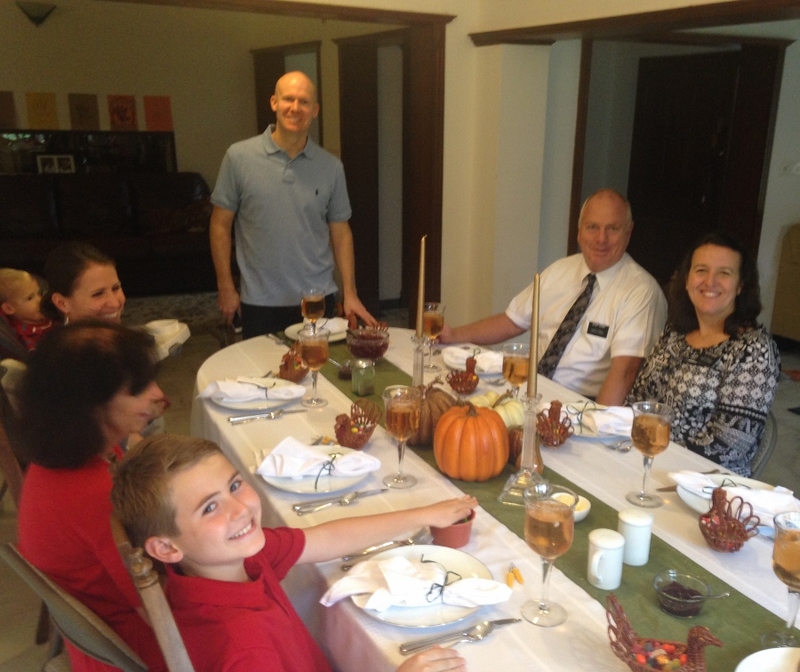 We joined them for some of the meals and are shown here with Elder and Sister Rasband. As we have said before, one of the best places we have found to eat in India is at the Jackson's. They invited us for a complete Thanksgiving dinner--including turkey, mashed potatoes, gravy. dressing, corn, salad, cranberries, pumpkin pie, and other desserts. We will definitely miss the Jackson's! We have heard about the cold and snow our family has been experiencing. It has been cold here in India, too. Our friend and favorite security guard, Kumud, is layered with a sweater, jacket, stocking hat, and cap. The night time temperatures have plummeted into the 60's. This is Sister Gantimi, who recently started her mission. She was raised in an orphanage in Chennai, that is operated by some members of the church. This is the church in Coimbatore, a city southwest of Bangalore, with the inside of the chapel shown below..
Below is the Lingarajpuram Ward Relief Society. Can anyone find Sister Bedke? We will finish with several random pictures of life in India.